A easy way to create your own tea bags in seconds while enjoying the taste of your loose tea selection. 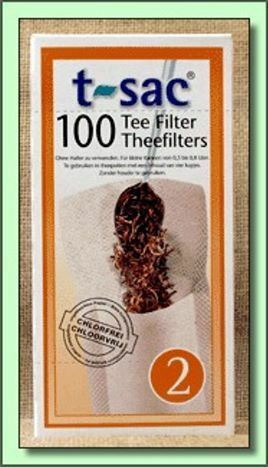 This filter size is perfect to place in one cup of tea or a 1-4 cup teapot! The benefits of T-Sac are that is is disposable and heat sealable (make your own tea bags). It has a gusseted (expanded) bottom to allow the loose tea to expand and release all its flavor. The flap folds over a cup or teapots rim allowing any cover to be snapped on tight! Each individual box holds 100 filters and has a flip top lid. Assuming you use our "1 Cup of Perfect tea" measuring spoon, use 2-3 spoons for this size filter for green, white, black and oolong tea for herbal use 2-4 and for herb and fruit 2-5. Always cool the water down for green tea from its boiling point before infusing.